1,It is erected in the both of bridge, used to move the load to bridge bearing. 2,It can be dedicated into male and female. Post end is placed in the two ends of the bridge, used for transmitting the bridge load to the bridge brace. End post comprises male and female. While installing, they are installed to the end respectively. The two holes on the side of the end post shall connect the upper and lower chord member of the truss frame, and the upper oval hole connects the second-floor truss; there are short cantilever and kinetic hasp with locating pin on the under-part of end post for setting and fixing transom. 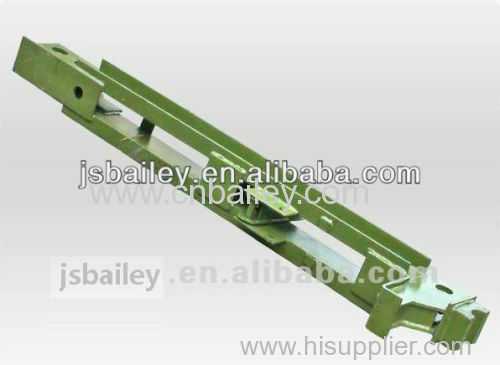 During long distance transport, move the kinetic hasp to the post inside and fasten with bolt. Saddle-shaped pad is welded to the post bottom for its locating on the axial girder.